In November, as Washington returned to business as usual following October’s government shutdown, stronger economic data and the appointment of Janet Yellen as the new Chair of the Federal Reserve provided a further boost to equity markets. By the end of November, however, Robert Shiller was advising caution toward equities based upon over-extended valuations, but stopped short of “sounding the alarm”. Evidence on US growth was more positive in November following a sharp decline in the Economic Surprise Index in October. The 4-week moving average of initial claims for unemployment insurance fell back to 332,000 by November 23 from 358,000 on October 26. The October US employment report posted a stronger-than-expected gain of 204,000 payroll jobs, but the unemployment rate edged up to 7.3% from 7.2%. Middle East tensions cooled substantially as implementation of the Russia-brokered agreement by Syria to destroy its chemical weapons began and the US-led negotiations with Iran over its nuclear program yielded a tentative agreement. With easing geopolitical risk and rising supply, crude oil prices continued their steady slide. After rising to $110 in September, their highest levels in two years, WTI futures prices fell through October and November to reach $92. Gold prices, responding to renewed concerns that the Fed will proceed with tapering of Quantitative Easing, continued to weaken, closing November at $1251 down from $1323 at the end of October. Corn prices also plummeted as the US EPA reduced the ethanol requirement for gasoline. As prices fell, commodities and inflation-linked bonds continued to be the worst performing asset classes of 2013. With crude oil and gold prices declining, the Canadian dollar remained on a weakening trend. After being supported by the Fed’s decision to delay tapering of QE in September, BoC Governor Poloz surprised markets in October by dropping the long standing tightening bias. With the tightening bias gone and commodity prices falling the C$ continued to weaken, dropping 1.7% against the US$ in November. The continued delay of Fed tapering, the Yellen confirmation and reduced Middle East tensions supported global equity markets. The S&P500 hit a record closing high of 1807 on November 27. Global equity ETFs posted solid returns in November in CAD terms, led by US (SPY), which returned +4.8%, Japan (EWJ) +3.1%, Eurozone (FEZ) +2.6%, and Emerging Markets (EEM) +1.5%. US small caps (IWM) returned 5.8%, outperforming the S&P500. Canada (XIU) underperformed, returning 0.8% reflecting the ongoing weakness in commodity prices. Bond market ETFs were mixed in November. Canadian bonds (XBB) gave back most of October’s gains, returning -0.6% in November. US long bonds (TLH) returned -1.8% in USD terms but with the weakening of the C$, lost only 0.1% return in CAD terms. Non-US global government bonds (BWX) posted a return of 0.4% in CAD terms. Emerging Market bonds performed poorly as USD-denominated bonds (EMB) returned -0.3% and EM local currency bonds (EMLC) returned -1.6% in CAD terms. Inflation-linked bonds (ILBs) were mixed. While Canadian RRBs (XRB) -- the worst performer -- returned -2.4%, non-US ILBs (WIP) returned -0.1%, and US TIPs (TIP) gained 0.7% in CAD terms. US investment grade (LQD) and high yield (HYG) bonds posted solid gains in CAD terms, returning 1.6% and 2.2%, respectively. Canadian corporate bonds (XCB) underperformed, returning -0.1%. 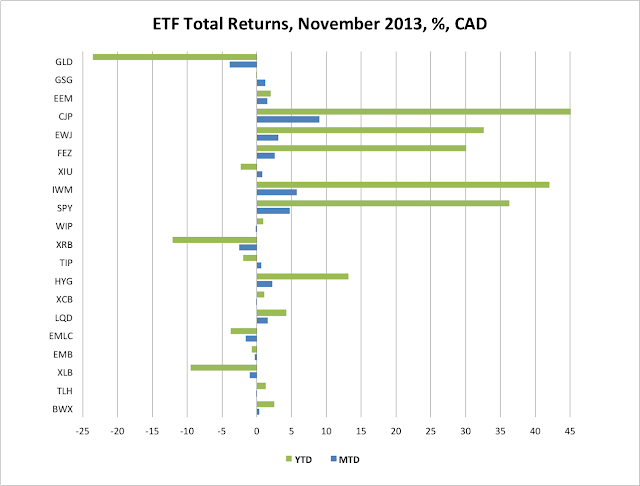 For November, a traditional Canadian 60% Equity ETF/40% Bond ETF Portfolio gained 155bps bringing its YTD return up to 14.8%. 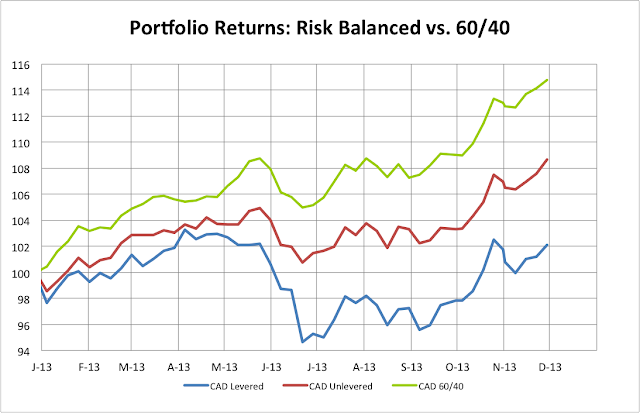 A Levered Risk Balanced (RB) Portfolio gained 35bps in November, bringing its YTD return up to about 2.1%, after it suffered a severe 8.1% drawdown over the April 26 to June 21 period. 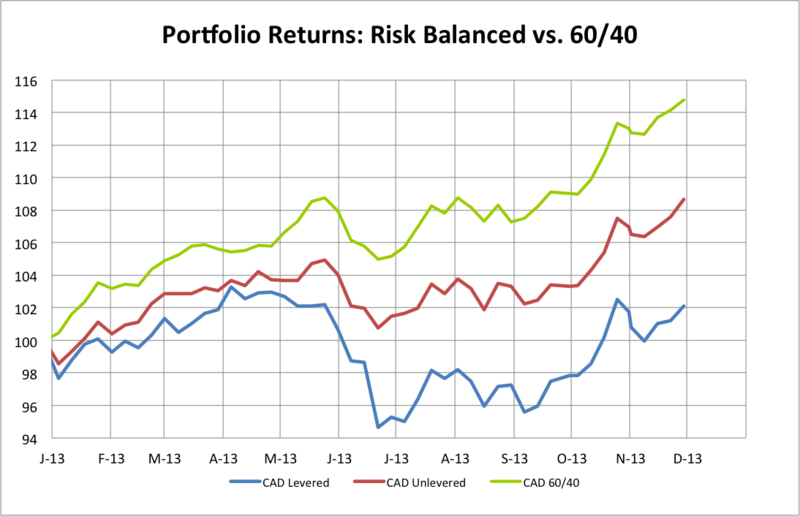 An Unlevered Risk Balanced (RB) Portfolio returned 159bps in November, raising its YTD return to 8.7%. The weaker returns in the Levered RB portfolio were attributable to the sell-off in the leveraged positions of Canadian nominal and I-L bonds. · US fiscal issues have been kicked down the road with the continuing resolution and Debt Ceiling deadlines temporarily extended into early 2014. There is an interim deadline for a bipartisan plan to replace sequestration with more palatable spending cuts by December 13, but there are no serious consequences if the deadline is not met. That means that uncertainty and market volatility over fiscal issues will not be a major factor until late in 1Q14. · Over the past month, economic growth data have been stronger than expected. The US Economic Surprise Index rose from -3.8 on November 4 to +9 on December 2. The JPMorgan Global Manufacturing PMI edged up to 53.2 in November from 52.1 in October, boosted by a solid gain in US Manufacturing PMI. · Globally, inflation continues to fall to the lowest readings since the Financial Crisis. Headline inflation has fallen below 1% in Canada and the Eurozone and remains sluggish in Japan. Central banks with inflation targets are being pressured to defend them with policy rate cuts or other forms of easing. · Central banks, which have focused heavily on supporting stronger recoveries and reducing output gaps are seeing some positive signs on this front. However, inflation continues to surprise on the down side and central banks are mandated to keep prices from slipping towards deflation. While stronger growth may lead some to believe that the Fed and other central banks will begin reducing monetary stimulus sooner, falling inflation is likely to keep central banks from doing so. In this environment, commodity prices continue to slide. Global excess supply conditions continue to weigh on oil prices and the spectre of Fed tapering is kryptonite to gold. Inflation pressures remain very weak and the risk of inflation dropping below 0% in many DM economies is real. From a market perspective, political risks have temporarily subsided, while growth surprises have turned modestly more positive and inflation disappointments continue. This is still an unfavorable environment for commodity prices and commodity currencies. It is also a weak backdrop for corporate earnings growth. Last month, I concluded that, “with cash returns pegged close to zero, the Fed extending QE indefinitely, and investors concerned that a bond market sell-off could resume with a vengeance if positive growth surprises re-emerge, it seems that flows into equities and corporate bonds will continue and could sustain further gains in these asset classes through November”. That proved correct. However, the continued run-up in equity prices has several high profile valuation gurus, including Robert Shiller and Jeremy Grantham warning that US equity valuations are rich. Yet both are stopping short of “sounding the alarm”, acknowledging that equities could rise another 20-30% over the next two years if monetary stimulus continues unabated. Signs of extreme equity market froth do not seem present. If US economic data remain buoyant and inflation remains extremely muted, the Fed will likely find reasons to continue to postpone tapering and, in the process, continue to support equity prices. The market is clearly vulnerable to a 10+% correction over the next few months, but this seems more likely to be a 2014 story than a December 2013 event. Equities, credit and government bonds are all richly valued but continue to be supported by near-zero interest rates and massive central bank liquidity injections. As equity prices continue to rise, the risk of a sharp correction when the Fed begins to taper continues to loom. When such a correction develops, it will likely be triggered by a sharp sell-off in government bond markets, which then spreads into the credit and equity markets. Wow. Nice year-to-date on CSD, but I see it had a large drawdown in 2008.